In the last few decades the Caribbean has emerged from a seemingly eternal golf slumber, becoming a destination to be reckoned with. In days gone by, tropical island golf was little more than an afterthought; the few courses in existence mostly basic and threadbare. But nowadays there are big-time, high-dollar venues sprouting like so much sugarcane in Jamaica, Puerto Rico, Barbados, St. Kitts and Anguilla, among other locales. 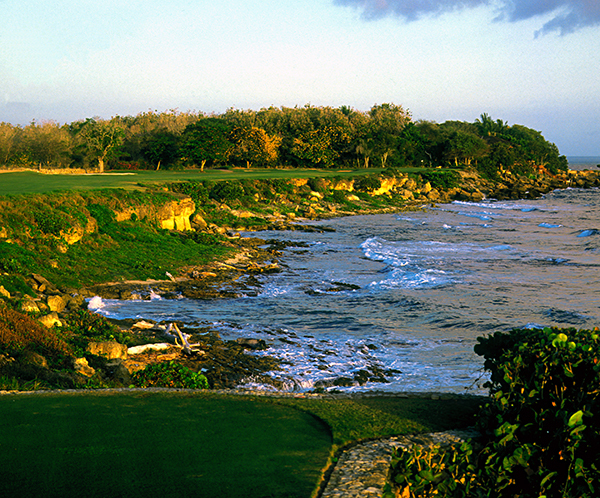 But for every White Witch or Green Monkey, (two of the nouveau marquee venues) the Dominican Republic’s Teeth of the Dog is still the most colorfully-named, and memorable course in the tropics. Pete Dye’s first-ever island creation remains the standard by which the others are judged. 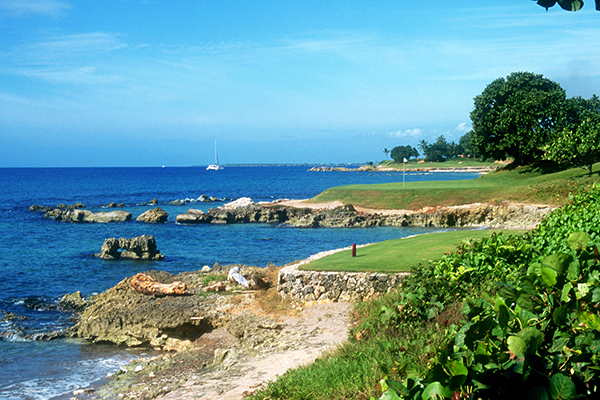 And some fifty years after the Casa de Campo resort opened, with high-end golf proliferating not just at the other islands but throughout the Dominican Republic itself, Teeth of the Dog, so named because the jagged coral rocks that buttress its seaside tees resemble canine canines, remains the standard upon which all others are judged. The idyllic ambience of Teeth of the Dog gives no hint as to its arduous origins. Importing the heavy equipment normally used in golf course construction was far too expensive. So Pete Dye made do with ill-suited machinery, whose true purpose was for sugarcane cultivation, and substituted man and oxen power instead. Three hundred Dominican laborers, armed with sledgehammers, pickaxes and chisels, literally pulverized the coral-and limestone-strewn property, one harsh blow at a time. Decent grass-growing soil wasn’t readily available either. So Dye and his crew dug a mile away, and loaded the soil, one square yard at a time, into sugarcane carts pulled by oxen. A byproduct of sugarcane called cachaza was mixed with sand and the imported dirt to form the topsoil for the golf course. Making matters even more difficult were the boulders in uncountable numbers peppering the proposed playing corridors. The laborers painstakingly carted them to the edge of what were to become the fairways, building a peripheral stone wall that eventually stretched two miles, and contained over twenty thousand tons of rock. The 7,000 acres that encompass the Casa de Campo resort is a tropical paradise of bougainvillea and hibiscus, not to mention a wide range of charming red-roofed casitas, high-dollar waterside mega-mansions and long range ocean views. The whole facility is a color riot and visual feast, and the prettiest acreage on the property is found at the Teeth of the Dog. For many years, Pete and Alice Dye made their island home in a thatched-roof, low-profile series of bungalows that sit unobtrusively among the showcase homes, to the right of the par-3 seventh. The Dyes former vacation home may be low-profile, but this signature design is anything but. 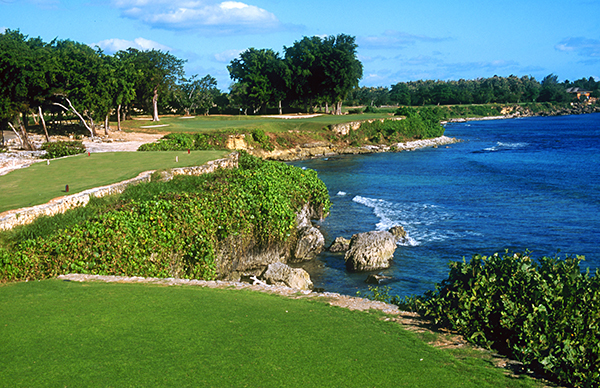 The course features overly generous fairways, and swaying greens, mimicking the movement, pitch and roll of the nearby Caribbean Sea. Speaking of which, among the seven seaside beauties which rightly cement the Teeth’s international reputation, the finest is arguably the fifth. Both the tee box and green protrude well into the lapping waves of the sea, and while subsequent par-3s are longer and more dangerous, none are as pulse-pounding. The penultimate hole also deserves mention. Only the boldest and bravest will attack this par-4 by launching over the ocean with a big draw or hard pull, looking far down the fairway. The rank and file will admire the stunning scenery, and then aim well left of “La Playa.” The long iron or fairway wood approach to follow is the price that must be paid for this conservatism. Teeth, whose inland holes wind through sugarcane fields and stands of coconut palms, royal palms, bitter orange, almond and teak trees, is generally a second shot golf course. Approach shots must skirt or avoid sand, water and swales, with a heavy toll exacted for indifferent ball-striking. The one-shot holes are easily among the finest quartet in the world, and besides the aforementioned fifth, the seventh and sixteenth are practically in the sea itself. Many newly-constructed courses make five or more sets of different tee markers available, claiming the course is appropriate for players of any caliber. But Teeth of the Dog truly delivers, on the waterside holes in particular. The excitement and intimidation factor, the anticipatory thrill of lofting the ball across the water, is available to all levels of golfer. At the championship level, the carry might be several hundred yards. At the most forward markers, it might be fifty. But the course is designed so players of even modest ability are never cheated out of the pleasure (or pain, as is often the case) of launching the ball over the sea to safety.